GLA teams researched and presented workshops on key topics throughout the week. Friday concluded an intensive and some would say life-altering week for the fellows of the Global Leadership Academy's 2016 cohort. Now in its fifth year, the yearlong program brings together a diverse group of faculty, staff and administrators from across Webster University. With a summer session at a campus abroad an annual highlight in the program's curriculum to help fellows better understand the network and of their own leadership capabilities, the past week at Webster Athens had a great impact in both respects. 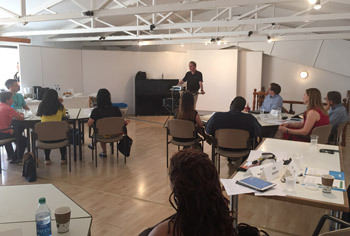 As he welcomed them in the middle of the week, Julian Schuster told the fellows, "You are doing the most important thing, you are changing yourself!" 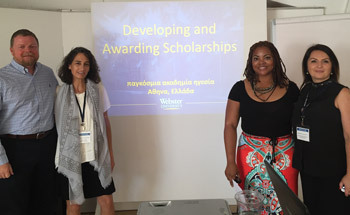 When the provost, senior vice president and chief operating officer of Webster asked what the fellows learned from the first part of their week in Greece, they had much to share about how it has altered their conception of Webster, and provoked new ideas in how they can lead in their own areas. Schuster heard the group's reflections on their experience. "We can see how each campus, each person is unique," Schuster said. "It is much harder to discern what is bringing us together." "I'm very grateful for this opportunity; I've already tapped into connecting with the cohort on a personal level," said Kristina Shimkus, Student Affairs, Geneva. "I now see potential in the relationship between the Geneva and Athens campuses and with the broader University." Vienna's Allison Snowden saw the potential for measuring success together across Webster, beyond individual campus or unit's achievements. And several fellows spoke of how the experience will improve what they can offer Webster students. "I can be a better advocate for our students, for the work happening in the Career Planning & Development Center, and for the broader University," said Marcie Schumert. Quinn Shao, associate professor in Math and Computer Science, noted the terrific energy at the Athens campus and how she is now thinking about opportunities for short-term study abroad programs and furthering her research. Longtime Conservatory of Theatre Arts professor Gary Glasgow also felt new appreciation from the faculty perspective. After working so long and hard at the departmental and college level, he said "I feel pride at the Webster level and how unique and special what we do really is." "Being here, you see the importance of studying abroad, the amazing opportunities Webster uniquely offers, and taking back to the faculty the need to encourage this among our students," said Remy Cross, associate professor of Sociology and Criminology. "It allows them to gain greater context no matter what their discipline." On that note, Jennifer Stewart, director of Student Engagement in St. Louis, said she will be better able to advise students considering study abroad since she has now seen an international campus and better understands the experience on a personal level. Justin Bitner of the Office of Institutional Effectiveness said that from this GLA experience, he sees the need to respect the local connections and local identity of each campus. "This experience shrinks the University down to personal connections and relationships," said Rick Gerger, director of Public Safety in St. Louis. Alexanderia Smith, faculty member in South Carolina, likened the experience to the meals the cohort has shared, and the need to share to make others feel welcome and engaged: "This is what is on my plate, you have some." And of course, the experience of Greece itself was a powerful one, particularly at this point in history. "I developed a love for the country and the people through talking to Athenian residents going about their day and stumbling on a huge march for civil rights," said Victoria Brown-Kennerly, assistant professor, Biological Sciences. "I will advocate for and work to support the people here." The fellows were supported all week by an invigorating team at the Athens campus, who also presented one of the sessions. 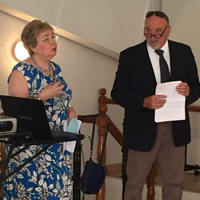 Athens vice chancellor Susie Michailidis and faculty member/director of Operations Tom Mazarakis delivered, "Leadership lessons from Greek history and philosophy." After the session, Laura Rein thanked the entire Athens team for their incredible support to make this such a meaningful experience for the GLA fellows. Bitner began helping the fellows understand the concept of data literacy, looking at data producers and consumers at the university, and examining case examples of data. Shimkus explained how the team approached collection of data for their learning project including the formation of the questionnaire and issues they faced connecting with the key stakeholders they identified. Jian Gong shared the results of the interviews the team was able to conduct, including data literacy challenges throughout the network and ways they are finding to improve data literacy at Webster. 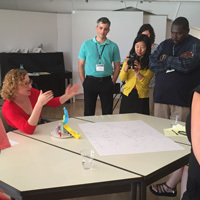 Basiyr Rodney and Schumert then led the fellows through a design challenge to explore new ways to address a data issue. 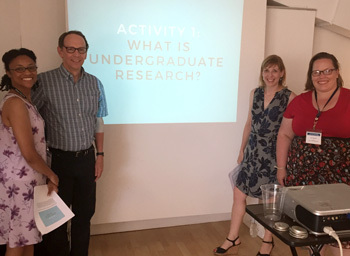 Stewart, Glasgow, Smith and Jennifer Starkey began with what undergraduate research is and what makes it a high impact educational practice. They defined research within higher education, giving an overview of how research has been viewed historically in the academy, how that view was revolutionized in the 1990s by Boyer's Model of Scholarship, and how that model has been incorporated at Webster. After an overview of the history of undergraduate research at Webster over the last century, the fellows learned about the differences between curricular and co-curricular activities and stakeholders involved in undergraduate research at Webster. Through video, the fellows heard from students who presented at the Spring 2016 RAD Conference and the faculty who mentored them. Jameca Falconer, Brown-Kennerly, Aleksandra Jancikova and Gerger presented on the importance of scholarships to students, the enrollment strategies in play with merit and need-based scholarships, and the unique challenges Webster's international campuses face in funding and awarding scholarships. Next the fellows looked at a draft of the University Scholarship Guide and learned how scholarships are awarded in St. Louis. They wrapped up with a review of cultivating donors, the relationship between the donors and recipients, and how data about scholarships is maintained. The fellows then worked through a scholarship-awarding simulation. Cross, Snowden, Shao and Cindy Yamnitz began their session on faculty and staff mobility with a brainstorming activity to consider ways that faculty and staff currently participate in international mobility opportunities and moved into a review of the literature on the topic. They discussed terms such as internationalization and globalization and looked at trends in internationalization in mobility programs. Beyond definitions, they explored outcomes and assessment to prove the benefits of these activities, including the Global Staff Exchange and the Faculty Mobility Program. They wrapped up looking at available data on faculty mobility. See highlights from earlier in the week, including President Beth Stroble's panel on collaborative leadership with ambassadors Ioseb Nanobashvili of Georgia and Lucian Fatu of Romania, and the fellows' exploration of their own leadership traits and strengths.